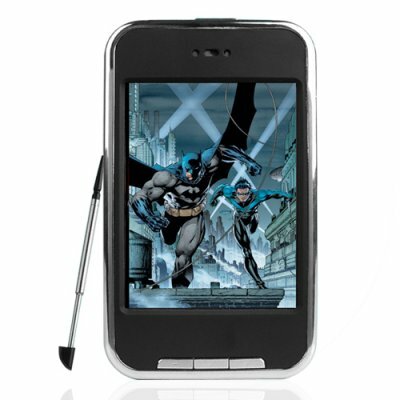 Successfully Added Touch Screen MP4 Player 8GB - 2.8 Inch TFT Display to your Shopping Cart. Touch Screen MP4 Player 8GB - 2.8 Inch TFT Display. Streamlined 8GB MP4 player with full touchscreen control and a beautiful 2.8 Inch TFT display for viewing movies and pictures. Complete touch screen control is one of the coolest features anyone could ever ask from a MP4. The responsive touchscreen control makes navigating through your MP3 audio and MP4 video files a breeze. All the other functions such as the FM radio and picture viewer are equally enriched by the ease use of a simple stylus or your finger. Why continue to mash the buttons of your old portable media player when you do not need to anymore? When you are not enjoying the fun of the touch screen, then how about just admiring the crystal clear LCD and high quality audio output from this unit? The high clarity earphone output (with bonus HD earphones) makes listening to your favorite tunes while out on the go a real pleasure. This little PMP is full of the latest features in modern MP4 digital media players while coming to you at a low factory direct price. A sure fire gift for yourself or the one you love and also a profitable consumer electronic device for resale. Click "Add to Cart" right now to have us ship you a single piece sample or bulk order of this product today! Bonus: Premium quality gold plated earphones now included!